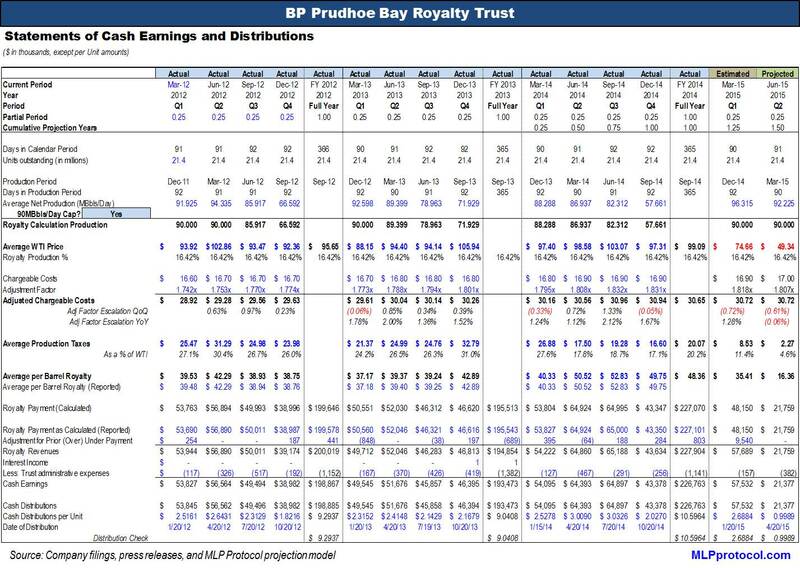 Last night BP Prudhoe Bay Royalty Trust announced a 2Q15 distribution of $0.9989143, which was about 4.6% higher than my modeled estimate of $0.9553. The average production in the press release was 92,225 Bbls/day, which was ~3.5% lower than my estimate of 95,528 Bbls/day. The lower actual production means that my long-term decline rate assumption for BPT is too aggressive to the positive side. If the actual decline curve assumption should be higher, then the projected trust payment will go to zero sooner. Here are my slightly updated estimates (updated 2Q financial estimates based on the distribution announcement). The next expected data point will be the filing of the 10-Q around May 8. As I type this post on the morning of May 7, BPT is up around 2% which is very, very impressive given the large decrease in the distribution (the outright short position is around 7% of total outstanding units). I am wondering if some investors didn’t see the news and will only realize the “yield” has declined once the yield information is updated on various data services, i.e. looking at Fidelity this morning it still shows a yield of ~18.4%, which may drop to ~6.8% once the new distribution is input into their system (if they continue to simply annualize the most recent distribution). The other take is that the entire investor base had expected the large decline in the distribution and that it was “already priced in,” but given the massive retail investor ownership as a percentage of the total outstanding units I find that hard to believe. We will have to wait and see how BPT trades once the “yield” numbers are cut on all of the data services. Disclosure: I am long various BPT Put Options. This entry was posted in BP Prudhoe Bay Royalty Trust and tagged BPT, distributions, dividends, investments, yield. Bookmark the permalink.